103.5+/- acres all workable and tiled at 33 feet. 2 road frontages. 2 deeds. Municipal water at road. 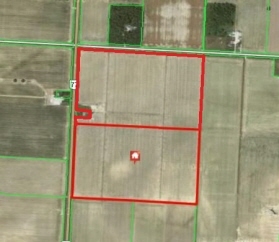 103.5+/- acres all workable and tiled at 33 feet. 2 road frontages. 2 deeds. Municipal water and natural gas at road. Current wheat crop can be purchased. Small lot has been severed off.